"The crisis and the civil war in former Socialist Federal Republic of Yugoslavia were the first great challenge for European security after 1989 not only because of the violence they caused and the geopolitical changes they brought to the European South East, but also because they showed inability of international security institutions and mechanisms developed during previous decades to prevent new forms of security threats. Balkan crisis 1991 - 2000 thus became a turning point, which considerably affected foreign policy thinking and strategies of the leading international actors and caused the redefinition of the role of numerous international security organizations. It also affected the entire profile of modern international relations in Europe. 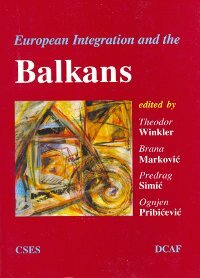 Departure from the political scene of the main protagonists of the crisis and the victory of the democratic forces in all Balkan countries in 2000 made possible gradual stabilization of the region and the processes of democratic reforms, economic transition, and approach to European and Euro Atlantic integration. Unlike former socialist countries of Central Europe, which relatively successfully went through this process, Balkan countries and primarily the countries of the so-called "Western Balkans" are the latecomers. In addition to the legacy of the previous communist regimes, they have also to overcome the legacy of a decade of civil war and isolation in an international environment, which is much less lenient towards the countries in transition than it was at the beginning of the 1990s. The first and the major challenge of these countries is the legacy of civil wars. It includes not only poverty, fragmented markets, destroyed infrastructure, hundreds of thousands refugees and internally displaced persons, and widely spread organized crime, but also a number of open and latent crisis spots in the south of the Balkans, which can still escalate in new ethnic and territorial conflicts. Another major challenge is lagging behind the developed areas of Europe and Central European countries in transition. That is why for many of these countries acquis comunautaire will be hardly attainable goal, whereas the forthcoming EU and NATO enlargement will further erect a "golden curtain" between the developed and undeveloped parts of Europe. Not even liberalization and development of regional cooperation can ease the burden of underdevelopment due to the legacy of distant and near past. During the Cold War these countries were separated by the "iron curtain" when their economies and societies were under the influence of distant metropolises."